The Slava is a complex of ritual and social practices celebrating a saint that is believed to be a family’s patron and a giver of prosperity. The celebration of the family patron saint (Slava) is practiced by most Orthodox Christian families throughout the Republic of Serbia as an important family holiday involving individual families and their guests – members of the extended family, neighbors, friends, and local community members. The celebration of the patron saint consists of the ritual offering of a bloodless sacrifice and a feast held for relatives, neighbors, and friends. The elements of a bloodless sacrifice are bread, wine, and wheat (symbols of Christ’s body and blood, fertility and prosperity). 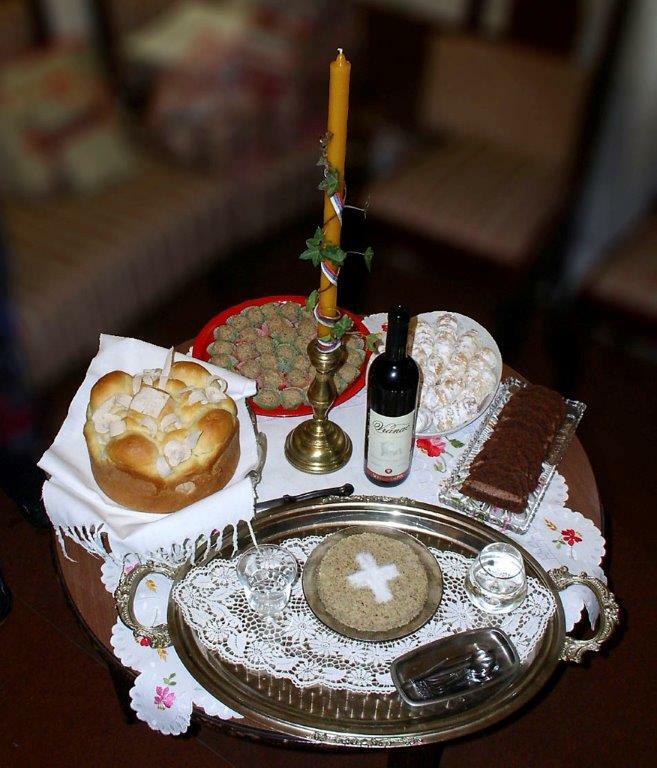 During the ritual on the day of the Slava, a specially designed candle is lit in the family home where the Lord’s Prayer is read and the cutting of the Slava cake (with the obligatory symbol IS HS NI KA) is performed by pouring wine over it, cutting it crosswise, then rotating it, and breaking it into four parts while lifting it up. During the ritual, thanks are given to the saint and prayers for prosperity are said. The ritual cake cutting is performed by the host with the oldest or the most important guest (“dolibasa”), the host’s heir, and other family members. The Slava feast begins with the ceremonial drinking of wine, eating of koliva and the Slava cake, giving a toast (“zdravica”), and expressing wishes for health, fertility, and well-being of the family and guests, and continues with a meal symbolizing prosperity. The Slava feast must include meat (suckling pig, lamb, or fish on the days of fasting) as a remnant of blood sacrifices. 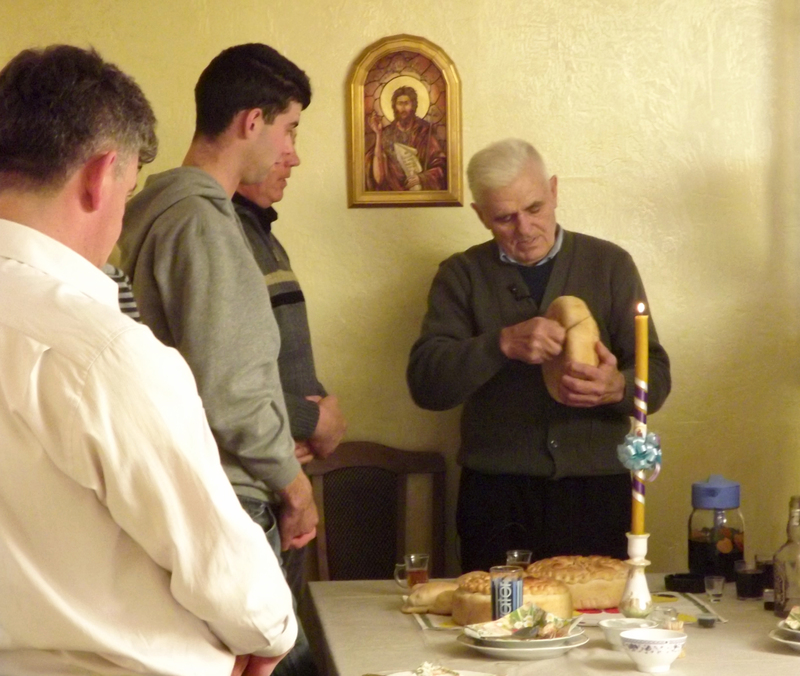 While preparing the feast, families in principle observe the Christian canon laws on fasting. A special role is played by the host – the oldest male member of the family – who organizes the celebration of the patron saint, cuts the cake and breaks it with the other participants in the ritual; he first says a prayer for prosperity. 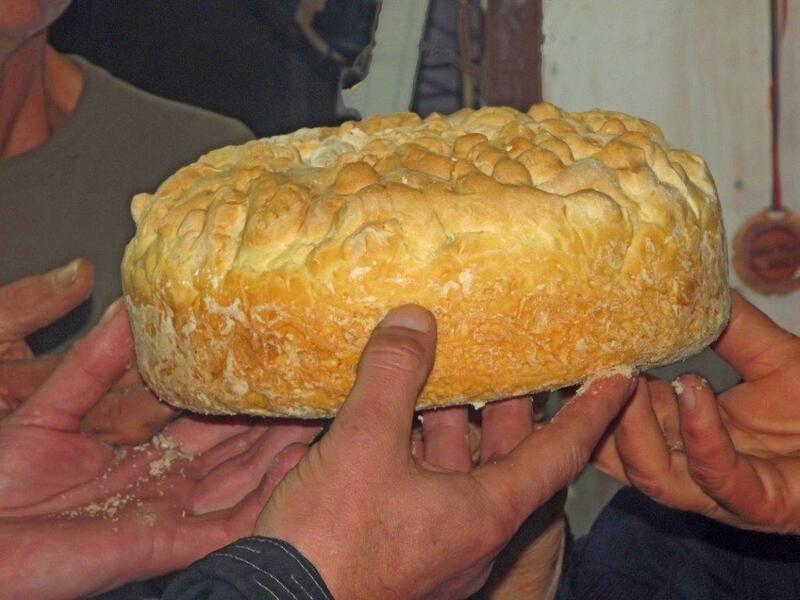 An important role in the ritual is that of dolibasa with cuts the Slava cake with the host. For the past two decades, children have been more and more frequently playing roles of participants in the ritual cutting of the cake at the celebration of the family patron saint. 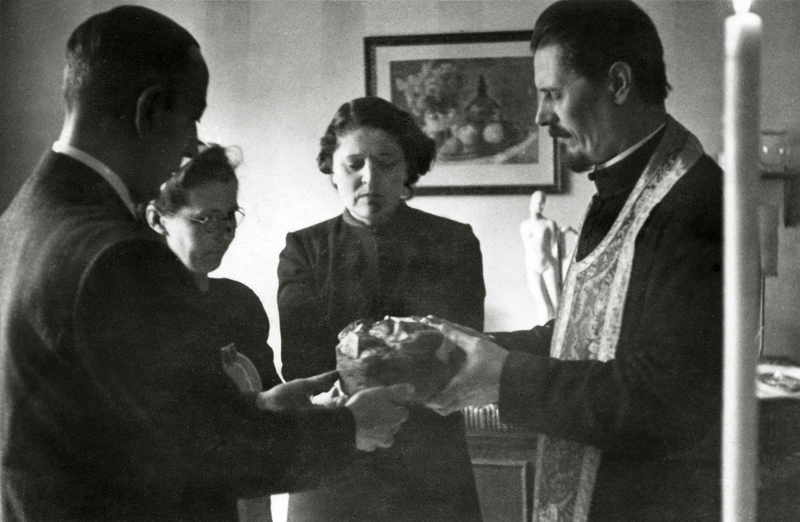 An Orthodox priest has an equal role in the cake cutting ceremony in a large number of families, regardless of whether the cake cutting is performed in the church or at their family home. 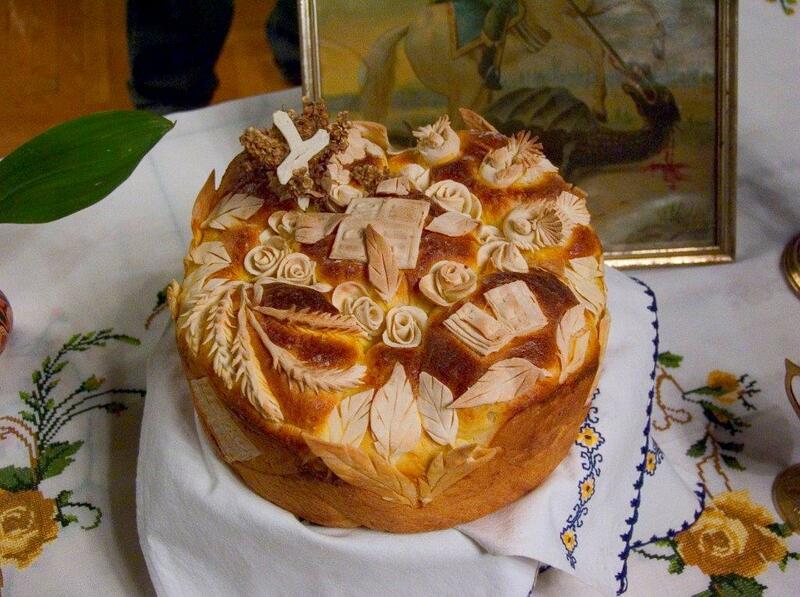 The importance of the host’s wife can be seen in the fact that she personally prepares the Slava cake(s) and then she demonstrates her skill when making dough ornaments and richly decorating the cake(s). Women play an important role in preserving and passing down traditional knowledge related to the Slava. They are the bearers of knowledge concerning the performance of rituals – they know the structure and chronology of rituals and they are the bearers of folk knowledge pertaining to the meaning and purpose of individual elements of the ritual – and they orally pass down such knowledge to the young members of the family as an integral part of family upbringing. A special role in the Slava rituals and during the festive feast may be played by a “zdravicar” [wassailer], the guest skilled in writing and delivering toasts – ritual verbal formulas asking for prosperity of the family. In the realm of religious thought, the celebration of the patron saint serves to provide the family with the religious way of communication with its patron saint and the way to a more certain future through this communication. In the culture of social relations, the Slava feast, as an essential part of the overall Slava ceremony and a form of a profane framework for the ritual sacrifice, has a clearly defined function in regulating interpersonal and intergroup social relations, a function based on a more or less strict reciprocity of hospitality. 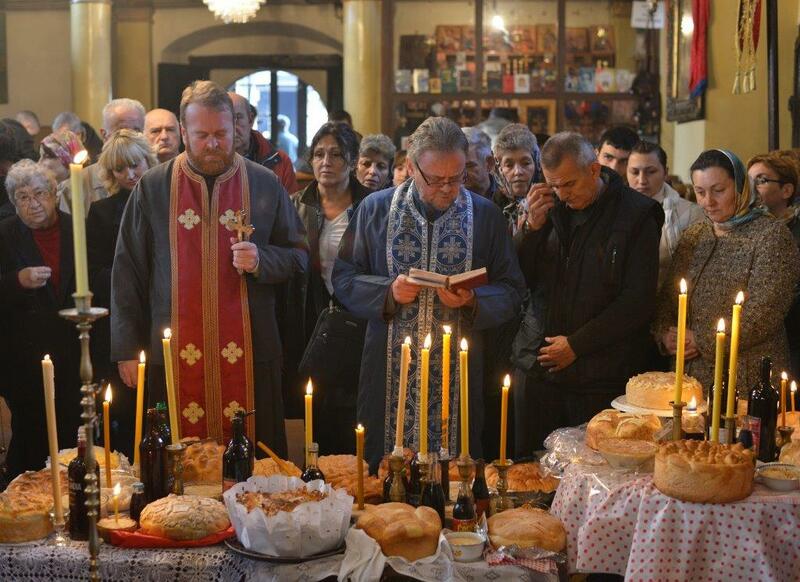 The Slava feast takes place in sacred time and space where maintenance of existing social relations and establishment of the new ones have the special “sacred weight” which ensures lastingness of those relationships. Social ties, time-tested and cyclically renewed in the sacredness of the Slava ceremonies, are used as social support in a variety of social and economic situations and social spaces. The celebration of the patron saint ensures the necessary integrity of the family within the community and integration within the wider community. The celebration of the patron saint is characteristic of Orthodox Christian families and, through participation in the Slava feast, it plays an important role in the establishment and maintenance of interethnic and intercultural dialogue in multi-ethnic and multi-confessional areas. The Serbs see the celebration of the patron saint as a means of expressing their ethnic identity and they are the bearers of this tradition, but the celebration of a family’s patron saint is also practiced by Orthodox Christian families belonging to other ethnic communities in Serbia.